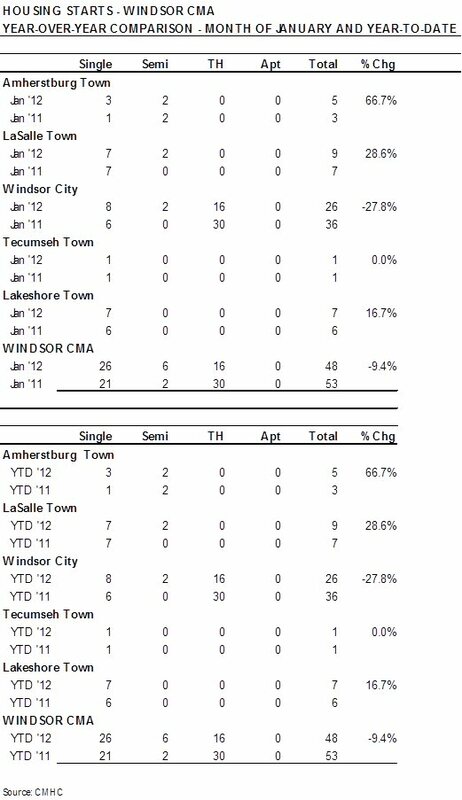 WINDSOR, ONTARIO--(Marketwire - Feb. 8, 2012) - New home starts were down in January in the Windsor Census Metropolitan Area (CMA) according to preliminary data released today by Canada Mortgage and Housing Corporation (CMHC). Builders laid foundations for 48 homes compared to 53 in January 2011. "The decline in construction versus January 2011 was due to the much lower construction of row housing," said Paul Tessaro, Market Analyst for CMHC. "However, row starts in January 2011 were higher than they had been in any month since June 2006, making the number somewhat atypical." January starts in the Windsor area included 26 single-detached homes, six semi-detached homes and 16 townhomes.